I am an historian of Africa with teaching specializations in east and southern Africa, France’s African and Indian Ocean empires, and slavery and the slave trades. My specific research and publishing concentrations are Madagascar and the western Indian Ocean islands with an emphasis on social, cultural, and intellectual history in the early modern period. I advise graduate students working on all aspects and eras of African history and French Indian Ocean empire, together with those having broad thematic and regional interests related to mine. I am especially interested in students who situate their research projects within broad comparative and thematic frameworks, crossing the traditional boundaries of African, Indian Ocean, and French empire history. I am currently working on two book projects. One is a history of literacy and power in highland Madagascar between c. 1820 and 1860 that digs deep into both missionary archives and the archives of the Kingdom of Antananarivo/Madagascar. It will be the first comprehensive study of the military bureaucracy of Madagascar during the nineteenth century and the first history of the Kingdom of Antananarivo/Madagascar based substantially on the archives of the state itself (rather than foreign sources). The other project is the collective biography of a mixed-race family of free origins based in île de France/Mauritius, in which the women came from Madagascar and the men from France. The family conducted commerce in the western Indian Ocean, with members on the Mascarene islands, Madagascar, and South Asia (Pondichéry). This project examines France’s Indian Ocean empire between about 1750 and 1850 through the experience of a single family and its many connections. Archival sources for this project are found in France and the western Indian Ocean. 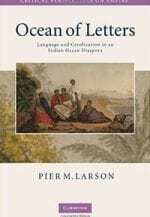 Ocean of Letters, my most recent book published by Cambridge University Press in 2009, is a study of imperialism, language, and creolization in the largest African diaspora of the Indian Ocean in the early modern period. Ranging from Madagascar to the Mascarenes, the Comores, and South Africa, the work sheds new light on the roles of slavery, emancipation, oceanic travel, Christian missions, and colonial linguistics in the making of Malagasy-language literacy in the islands of the western Indian Ocean. In it, I explore how enslaved and free Malagasy together with certain European colonists and missionaries promoted the Malagasy language, literacy projects and letter writing in the multilingual colonial societies of the region between the seventeenth and mid-nineteenth centuries. Addressing current debates in the history of Africa and the African diaspora, slavery, abolition, creolization and the making of modern African literatures, Ocean of Letters crosses thematic as well as geo-imperial boundaries and brings fresh perspectives to Indian Ocean history. It is primarily based on research in European and Indian Ocean archives. “Africa in the Early Modern Era,” in The Cambridge History of the World Cambridge University Press, edited by Jerry Bentley and Sanjay Subramanyam, forthcoming. “Slaving in Africa,” in The Princeton Companion to Atlantic History, Edited by Joseph C. Miller (Princeton University Press), in press. “Literacy and Power in Madagascar,” Journal of African History, in press for 2014. “African Slave Trades in Global Perspective,” in The Oxford Handbook of Modern African History, Edited by Richard Reid and John Parker (Oxford University Press, 2013), 56-76. “La rue coloniale: Ratsitatanina et la créolité dans l’océan Indien,” in Henri Médard, Marie-Laure Derat, Thomas Vernet and Marie Pierre Ballarin, eds., Traites et esclavages en Afrique Orientale et dans l'océan Indien (Paris: Karthala, 2013), 441-460. “Fragments of an Indian Ocean Life: Aristide Corroller between Islands and Empires,” Journal of Social History, Volume 45, Number 2 (Winter 2011), 366-389. “Horrid Journeying: Narratives of Enslavement and the Global African Diaspora,” Journal of World History 19,4 (2008), 431-464. “The Vernacular Life of the Street: Ratsitatanina and Indian Ocean Créolité,” Slavery and Abolition 29,3 (2008), 327-359. “Enslaved Malagasy and Le Travail de la Parole at the Pre-Revolutionary Mascarenes,” Journal of African History, 48,3 (2007), 457-479. “Malagasy at the Mascarenes: Publishing in a Servile Vernacular before the French Revolution,” Comparative Studies in Society and History 49,3 (2007), 582-610. “Colonies Lost: God, Hunger, and Conflict in Anosy (Madagascar) to 1674,” Comparative Studies of South Asia, Africa and the Middle East, 27,2 (2007), 345-366.